"Do you wish peace or war?" "Peace," answered De Soto promptly. "We ask only permission to pass through your province, transportation across the river, food while we are in your territory and the treatment of friends, not foes." Gravely the Indian listened, gravely he answered. Peace, he said, could be assured, but for the other requests there must be time given to make answer. Cofachiqui, queen of the province bearing her name, must be consulted. Of food there was a scant supply because of a pestilence which had recently ravaged their land causing many natives to go into the forests, and preventing them from planting their fields as usual, but if the strangers would await Cofachiqui's response to their demands with what patience they could command, that patience would surely be rewarded. The Indian ceased speaking and bowed. Gravely his companions also bowed. The interview was over. With silent sinuous strides the chiefs retraced their steps to the river, and entered their canoes which soon shot through the water, homeward bound, watched by the eager eyes of the waiting Spaniards. Now although De Soto had shown surprise at the news that the ruler of the neighbouring province was a young princess, the surprise was not genuine. Some months earlier in the season, while encamped in what is now the State of Florida, an Indian had been captured and brought into the Spanish camp. This youth had told thrilling tales to the Spaniards of the fascinating young Queen Cofachiqui and he related to a breathless audience how all the neighbouring chiefs paid tribute to her as to a great ruler, and sent her presents of magnificent clothing and provisions and gold. At the mention of gold which was the ruling passion of De Soto and his followers, they plied the young Indian with further questions, and he, hoping for release as the price of his information, told in detail of the wonderful yellow metal which was found in such quantities in the province of Cofachiqui and neighbouring territories and how it was melted and refined, and as the Spaniards listened, they exchanged glances of joy that at last after all their weary wanderings, they were to find the long-looked-for treasure. At once they broke camp, robbing and plundering the Indians, without whose kindness and hospitality during the long Winter months they would have fared badly, but of that they were careless, and in every possible way drained the stores of the savages who had befriended them, in fitting themselves out for their expedition northward. Then for long weeks they pressed onward through the trackless forest with no chart or compass, except such general directions as they received from the young Indian, to guide them, and as they travelled they left behind them a trail of theft and barbarous cruelty and murder in return for the kindness of the simple-minded natives whom they encountered in their march. At last in late April they found themselves in the territory governed by Cofachiqui, the fair young girl who was ruler of many provinces and possessor of much gold, and their hopes of conquest were high. So, in accord with] a hastily-laid plan, they massed themselves on the east bank of the river, with the sunlight glinting through the great forest trees behind them, shining on their weapons and armour, and thus they received the visit of the Indians from the town of Yupaha, capital of Cofachiqui. The interview was over—the Spaniards watched the chiefs as they disembarked on the opposite shore, saw a great crowd of natives gather around them, engaging in eager conversation, saw canoes being again made ready for use, one more showily ornamented than the others being filled with cushions and mats, over which a canopy was hastily raised. The eyes of the Spaniards were strained to lose no detail of the Indians' preparations as four strong young braves came in sight, carrying a palanquin down to the river edge, from which a young woman alighted, and gracefully stepped into the gaudily decked canoe. "The Princess! It can be no other!" exclaimed an excited and susceptible dragoon, and all eyes were at once centred on the slight, lithe figure seated now in the canoe. She was followed by eight Indian women, who also seated themselves in the boat with their Queen and took up the paddles, making the little craft cut swiftly through the water by the power of their deft strokes, while the men followed in another canoe. The shore was reached. Gracefully, quietly the princess stepped from her barge, and ascended the bank, her women following in an impressive procession, until they stood before the army of expectant Spaniards. De Soto, after one glance into the lustrous dark eyes of the girlish princess, rose and placed the throne chair by his own side, and with a swift and gracious acknowledgment of his courtesy, the princess took it, and began to speak rapidly in a low melodious voice. "My chiefs tell me you ask for provisions and shelter while passing through my provinces," she said. De Soto asked his interpreter what her words meant and inclined his head in affirmation, while his soldiers watched the mobile face of the princess, fascinated by her beauty, as she spoke again. "We give you and your men a hearty welcome and will protect your interests as if they were our own while you remain with us," she said. "But for provisions, my chiefs told you of the pestilence which has so ravaged our land that the fields have not been planted as usual, but I have two storehouses filled with grain which I have collected for the relief of those whom the pestilence has spared, one of those shall be at your service, sir. As to your accommodation," this with a graceful wave of her hand as though including De Soto in all that she possessed, "half of my own house is at your disposal, and your men may make themselves at home in as many of the buildings in the village as are necessary, for barracks." Watching De Soto's face, and fancying she saw disapproval there, the princess hastily added, "But if that is not satisfactory to you, oh, sir, I and my people can retire to a neighbouring village, leaving you in possession of my own." Her winning hospitality was not to be resisted. A grave and courtly smile flitted over De Soto's face and he hastily reassured her that this would not be necessary, then asked if she could provide them with a means of transportation across the river. To this Cofachiqui replied, "That has already been attended to, and to-morrow morning rafts and canoes will be in readiness for your use." While she was speaking, De Soto had fallen under the spell of her musical voice and personal charm and when] she finished he rose, and bending over her hand, kissed it in true cavalier fashion, assuring her of his loyalty and good faith, as well as those of his sovereign, and although the vow was as insincere as it was effective, it gave great joy to simple-minded, big-hearted Cofachiqui, who believed that these foreigners were as trustworthy as she was, and were hereafter to be her friends and allies. Slowly she unwound a long string of pearls as large as hazelnuts that were wound three times around her graceful throat and fell in a long strand to her waist, and handing them to De Soto's interpreter, she asked him to present them to his commander whose eyes gleamed at sight of the magnificent jewels, although he shook his head saying gallantly, "But Madame, they will be doubly precious if given by your own hand." "More indeed than the pearls themselves would I value the favour of receiving them from her hand, and in acting so she would not go against modesty, for we are treating of peace and friendship, of all things the most important, most serious between strange people." Having heard this apparent declaration of amity the princess allowed herself to be persuaded, then rose, and with her own hands placed the string of costly pearls around the neck of De Soto. He too stood, and taking from his hand a valuable ring, set with a large ruby, which he had doubtless pillaged from the Peruvians, he begged Cofachiqui to accept it. Won by his magnetism and courtly manner the heart of the princess beat fast, and with evident pleasure she accepted the ring and placed it on her finger. 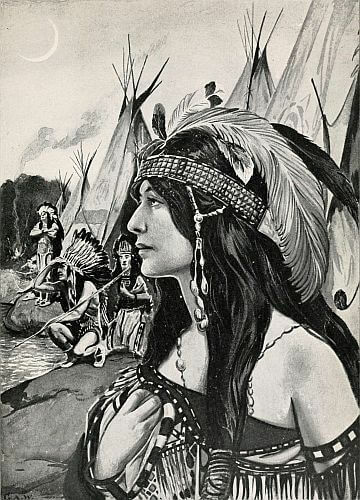 Then with a bewitching smile to De Soto, and another to his men, she turned and retraced her steps to the river, and followed as before by her attendants, she again entered the canoe which under the impelling strokes of the sturdy Indian women, shot homeward, leaving the ranks of the Spanish army quite demoralised by such a vision of youth and beauty, as well as charmed by a strength of character which made them call the princess then and ever afterwards La Sanora, or the lady of Cofachiqui, and both then and ever after did she deserve the title, for no truer-hearted, kindlier-mannered aristocrat ever made and kept covenant of faith with a treacherous foe, than did she, this sweet princess of a barbarian race. So much in love with her already were the susceptible Spaniards that they awaited the morrow with extreme impatience and could only while away the hours with tales of her perfections told to the master of camp and the remainder of the army, but just arrived from the interior. At the appointed hour of the next day came the promised rafts and canoes to transport them, and soon De Soto and his cavaliers found themselves in the most beautiful spot, and among the most hospitable Indians they had ever yet encountered. They were peaceable and affable in manner and almost as white as the Spaniards themselves, and so intelligent that it was possible to gain much valuable information from them concerning the region and its products. As for the lovely princess herself, daily the strangers became more astonished at her soundness of judgment, and practical grasp of affairs, which would easily have challenged many a white man's mental capacity. With eager desire to make her guests as comfortable as possible, and also with a touch of personal interest in the handsome cavaliers, Cofachiqui ordered wigwams to be put up for the soldiers under the shading mulberry trees, placed houses at the disposal of the officers and made everything bend to the comfort of the Spaniards to such a degree that the delighted army approached their general with a petition to make a permanent settlement there. But De Soto was a man of one controlling passion and was impervious to all pleas, reiterating these words, "Our quest is for gold, not for comfort or for courtesy. We must press on." A man of few words but of inflexible purpose, the soldiers knew only too well the uselessness of entreating him further and putting aside their emotional appreciation of Cofachiqui's kindness, even while accepting all that she gave them, set to work and secretly discovered the burial place of her people, and robbed it not only of figures of babies and birds made of iridescent shells, but also of three hundred and fifty weight of pearls. Then, fired with the lust of possession, and having found out that Cofachiqui's widowed mother, who lived in retirement forty miles down the river, was the owner of many fine pearls, De Soto at once began to plan to get her in his power. Of this he gave no hint to the princess, but pretended, in his long daily conversations with her, that he was her loyal friend, and his only aim was peace so long as he and his men should be in her territory. At the same time he suggested casually to Cofachiqui, who was still somewhat under the spell of his magnetic personality, (although now not altogether unconscious of the selfish deeds done to her people in his name) that perhaps her mother would enjoy coming up to Yupaha to meet his people who were unlike any she had ever known, also to see the wonderful animals they rode,—for the fine horses of the Spanish cavalrymen were the greatest admiration of the Indians. To his suggestion Cofachiqui gave a pleasant assent, and at once De Soto's message was conveyed to the Queen's mother by a young Indian who had been brought up as the elder woman's own son. But the Queen's mother had lived longer, and had a broader knowledge of the world and of the treachery of the white man than had her daughter, and instead of accepting the invitation in the spirit in which it was apparently given, she sent a sharp reproof to Cofachiqui for having allowed strangers about whom she knew nothing to invade her capital. The news was duly brought to De Soto, who set his firm lips more firmly still, and then ordered one of his officers, Juan de Anasco, to take with him thirty men and start at once for the dwelling-place of the Queen's mother, and force her not only to see them, but also to return with them to the camp. On hearing this, the princess argued with him as to the uselessness of the expedition. "My mother," she said, "is of a firm will and tenacious purpose. Had she been willing to see you, she would have come at once. Do not urge her." But De Soto spoke in a tone of firm command, telling her that she must supply a guide for the expedition, and with no further sign of reluctance Cofachiqui again commissioned the young Indian, of whom her mother was so fond, to lead the strangers forth, hoping that the lad's coming would make a stronger appeal to her mother than all the force that could be used. When the young fellow stood equipped for the journey, receiving his instructions from Cofachiqui, he was so strikingly handsome, both in face and stalwart figure, that even the Spaniards could not but note it. On his back was strung a magnificent bow as tall as he, and a quiver full of arrows, his mantle was of finest softest deerskin and on his head was set a coronet of rare feathers. That evening the party set out, and on the following day when the sun was high, stopped to rest under a spreading clump of trees, and as the Spaniards lounged in the refreshingly cool spot, the young guide sat apart, not entering into the gaiety of his comrades, but with his head bent in his hands, in apparently deep and melancholy reverie. Then rousing with a start, he threw himself down beside the others and began to show them the arrows with which his quiver was filled, and the Spaniards examined them with eager interest and surprise, for they were gems of carving and of polish, and each one was different from the other. While the soldiers' attention was thus centred, the young Indian gave a quick glance at them, then suddenly he drew out a dagger-edged flint head, plunged it into his throat and fell at their feet. With cries of horror they bent over him, but it was too late. The cut had severed an artery and life was already gone from the noble form. "You ask me to betray those who have given me loyalty and trust? You call these strangers unworthy of confidence because they demand the presence of my mother? How do we know what the white man's code of honour about such matters is? To the very end I shall keep my covenant of good faith with them and you as my people will do as I command!" Her firmness was so evident, and so did she hold her people's hearts in her keeping that the old chiefs never again mentioned that which was making more than one in the community uneasy, but they were no less troubled because Cofachiqui showed no concern about the matter. Their conference over, the Spaniards had decided to press on without a guide, and for two days wandered aimlessly through jungles and swamps in excessive heat and discomfort, then, exhausted by disappointment and by the weight of their heavy armour, they returned to the camp in no happy frame of mind, carrying with them the sad news of the young guide's death, upon the reason for which Cofachiqui pondered long and deeply. Once decided on a course of action, De Soto was not a man to be balked, and when several days later an Indian secretly came to him with an offer to personally conduct him to the home of the queen's mother, the offer was gladly accepted and a second expedition set out. But the lady in question was a person of determination too, and hearing of the approach of the party, doubtless from one of Cofachiqui's chiefs, she quietly fled to some more sheltered spot, and after six days of wandering in search of her, the party returned to camp in disgust and never again attempted to visit her. Even when apparently absorbed with other things, De Soto's whole mind was centred on planning how to discover the gold which he had been told could be found in such large quantities in the territory belonging to the princess. Always a diplomat, he spoke carelessly of the pearls which she had given him, asked whether she also owned any yellow and white metals similar to the rings and other ornaments he showed her. As always when she talked with him Cofachiqui's eyes sparkled, and her whole nature seemed to go out to him in confidence and interest. "Indeed, yes," she made answer through her interpreter, "on my land there is an abundance of metals, both white and yellow." De Soto's eyes gleamed at the statement. Then she summoned an Indian, and directed him to go at once and bring to her specimens of both kinds of metals. With ill-concealed impatience De Soto waited for the messenger's return, and almost snatched the small lumps from his hands, as the messenger brought them to the princess. With radiant joy she handed them to De Soto, glad to give another proof of her friendship. One look was enough, the yellow metal was only copper, the shining white specimen was a worthless kind of quartz! Glancing at De Soto with eyes full of pride in the products of her realm, Cofachiqui's expression changed to one of surprise and fear, for on the face before her she saw such rage and hatred that she knew something dangerous had happened; and trembled lest revenge should be visited on her guiltless people. In a gently soothing voice she hastily said, pointing with a graceful wave of her hands to a spot in the distance, "Yonder is the burial place of our village warriors. There you will find our pearls. Take what you wish, and if you wish more, not far from here there is a village which was the home of my forefathers. Its temple is larger than this. You will find there so many pearls that even if you loaded all your horses with them, and yourselves with as much as you could carry you would not come to the end of them. Many years have my people been collecting and storing pearls. Take all and if you still want more, we can get even more for you from the fishing place of my people." What an offer! It could be no other than evidence of a heart's real devotion, or of deep rooted fear, when an Indian princess offers to rob the burial place,—the treasure house of her ancestors! While Cofachiqui, with appealing eyes, made the offer as a substitute for what De Soto had evidently been disappointed in finding, the Spaniard's hopes revived, and with a quick reassuring gesture he took and kissed the hand of the princess in his most courtly manner, which courtesy she received with proud dignity, and gave no further evidence that her heart had ever been touched by the fascinating general. De Soto lost no time in accepting the offer made by Cofachiqui, and two days later, with a large number of his officers, and escorted by some of the household of the princess, who made no promise which she did not carry out to the full, De Soto visited the temple of which she had spoken. During the three mile trip, they passed through such wonderfully fertile country, saw such luxuriant vegetation, picked so much luscious fruit hanging in profusion from the fruit trees on the way, that the cavaliers felt this to be truly the promised land and again begged their commanding general to make a settlement here, but he only responded by silence and by marching on. At last the temple was reached. Impressively the Indians threw back the massive doors and on the threshold the Spaniards stood, spell-bound by the beauty and the majesty of what they saw, so the historian of the party tells us. Twelve gigantic wooden statues confronted them, counterfeiting life with such ferocity of expression and such audacity, of posture, as could not but awe them. Six stood on one side and six on the other side of the door, as if to guard it, and to forbid anyone to enter. Those next the door were giants about twelve feet high, the others diminished in size by regular gradation. Each pair held a different kind of weapon and stood in attitude to use it. Passing between the lines of monsters, the foreigners entered a great room. Overhead were rows of lustrous shells such as covered the roof, and strands of pearls interspersed with strings of bright feathers all seemed to be floating in the air in a bewildering tapestry. Along the upper sides of the four walls ran two rows of statues, figures of men and women in natural size, each placed on a separate pedestal. The men held various weapons, and each weapon was ornamented with a string of pearls. The burial chests were placed on benches around the four sides of the room, and in the centre, on the floor were also rows of caskets placed one on top of the other. All the caskets were filled with pearls, and the pearls were distributed according to size, the largest in the large caskets, the smaller seed pearls in the smallest caskets. In all there was such a quantity of pearls that the Spaniards confessed to the truth of the statement of Cofachiqui, that if they loaded themselves with as many as they could carry, and loaded their three hundred horses with them, too, there would still be hundreds of bushels left. And, too, there were in the room great heaps of handsome deerskins dyed in different colours, and skins of other animals. Opening out of this great room were eight small rooms filled with all sorts of weapons. In the last room were mats of cane so finely woven that few of the Spanish crossbowmen could have put a bolt through them. The Spaniards were greatly elated with the discovery of such a store of treasure, and it is said that De Soto dipped his joined hands, made into a receptacle for the purpose, into the piles of pearls, and gave handfuls to each cavalier, saying that they were to make rosaries of, to say prayers on for their sins. For some strange reason, however, most of the jewels were left undisturbed, perhaps in the same way that fortunes are left in a bank, to be drawn on at will. Sure we are, from the true account of the historian, that the Spaniards were fully aware of the value of the pearls given to them by Cofachiqui, and sure it is also that De Soto must have exulted with a passion of triumph at being the lawful owner of such treasures. But his desire for gold, his greed for gain, was insatiable. Having examined his newly acquired store house of possessions he eagerly inquired of the Indians if they knew of any still richer land farther west. This question gave Cofachiqui's chiefs the chance they had been hoping for to rid themselves of him whom they now knew as a treacherous guest, and they hastily assured De Soto that farther on to the north was a more powerful chief ruling over a far richer country, called Chiaha. The news delighted De Soto and he determined to march on at once. In vain his men pleaded to remain where they had found such treasure, had been shown such kindness—his reply was that there were not enough provisions in the province to support their army much longer, and that by continuing their march they might be repaid by finding the longed-for gold. But he added, cannily, should their quest be unsuccessful they could return, by which time the Indians would have replanted their fields and there would be abundance of food. As usual, he had his way, and the tidings were brought to the princess that the foreigners were to take up their march for Chiaha, on the fourth of May. Doubtless she was not sorry, for during the latter part of their stay, their treachery and cruelty had been so evident, that whatever feeling of comradeship with them she had before felt, must have been rudely dissipated, and seeing evidence of her changed sentiments De Soto was so uneasy lest like her mother she should flee from him, that he appointed a guard who kept watch over her by day and by night, so she could not by any possibility escape. To the cavalier who was appointed to this task, no menial labour could have been more humiliating, and he accepted it under protest, but the lady of Cofachiqui over whom he was obliged to keep guard showed no signs of being disturbed at her position, but with proud and haughty glances went calmly about her daily tasks as though it was a common thing for her to have a keeper. Then came the day of De Soto's leave-taking, and masking her joy at the event, Cofachiqui stood proudly to receive his farewell, with as much grace and dignity as on the day when she had received him and his men. But suddenly her eyes flashed with anger, her throat parched with humiliation, a frenzy of proud horror and rebellion filled her—she heard the man who had before kissed her hand so chivalrously, who had so fascinated her, give the stern command that she, La Sanora, Queen of the realm, was to accompany the Spaniards on foot with her retinue of women attendants! "And what is this for?" she flung out the question with an imperious challenge, but De Soto vouchsafed no answer, and the army took up its march with the little band of Indian women safely guarded at the rear. Cofachiqui soon found out why she had been carried on the expedition, for De Soto obliged her to make use of her influence in controlling the Indians along his line of march, so that his army not only was not attacked, on account of the protecting presence of the gracious ruler for whom her people had such a deep affection, but also at her command they supplied De Soto with guides, as well as with men to carry baggage and provisions, while travelling through her territory. For a week, another and still a third, Cofachiqui was dragged in the vanguard of the Spanish army, a prisoner, and with the passing of each day in captivity to these traitorous white men on whom she had formerly looked with such reverence, her heart grew faint with apprehension, deep shadows came beneath her lustrous eyes, and there was never a sound of her silvery laughter as of old. But these were the only visible signs of the effect of her subjection. To the Spaniards she was still courageous, calm and dignified, whatever she may have felt. Then came a wild night of storm in the forest, torrents of rain and mighty wind that roared and thundered through the great trees, shaking them as if they had been saplings. While the tempest was at its height Cofachiqui, by a signal known only to her tribe, summoned one of her faithful women to her side,—by signs told her what she had to tell,—then the woman crept stealthily back to her forest bed, and there was no sound in the encampment but the roar of the wind and rain. The next day dawned cloudless, and at an early hour all the Spaniards were busily at work, repairing the severe damage done by the storm. In replacing a tent a woman's deft hand was needed, and Cofachiqui's name echoed through the forest. No answer came, and an impatient cavalier himself ran to summon her. At the door of her tent he stood as if turned to marble. Cofachiqui was not there! Not a bead, an ornament, an article of clothing, was to be found! No, nor the casket of wonderful pearls entrusted to her care by De Soto. La Sanora, queen of many provinces, lady of the land she had ruled over so wisely and so well, had fled, and all her women with her! Never again, despite De Soto's frenzied and persistent search, despite the added efforts of the united Spanish army, did they discover any trace of the brave, beautiful young girl who had received such treacherous treatment in return for her gracious hospitality. Clever Cofachiqui! Where she fled, or how she fled, or when she fled, will always be a mystery, but her name has come down to us on the pages of historic legend, not as fairy-tale but as fact, and she stands with the lime-light of ages thrown on her clear-cut character as a girl sweet, brave and loyal—the most precious relic bequeathed to the New World by De Soto and his cavaliers. Add Cofachiqui: An Indian Princess of Historic Legend to your own personal library.